BroadwayCon day one, MEOWexander Hamilton makes his debut! He was such a hit! I felt so confident as a founding father jellicle, it was weird and amazing. This year the convention was held in a wing of the Javits Center in NYC so there was much more space but it was a bit longer of a walk than just downstairs. The vendor hall was the main walking area and there were different rooms for the panels. The autograph/photo sessions were at the end of the hall and honestly did not seem as popular as last year. The main stage felt less 'theatrical' and more 'held-in-a-warehouse' but honestly, this year was more about interacting than large-scale events. 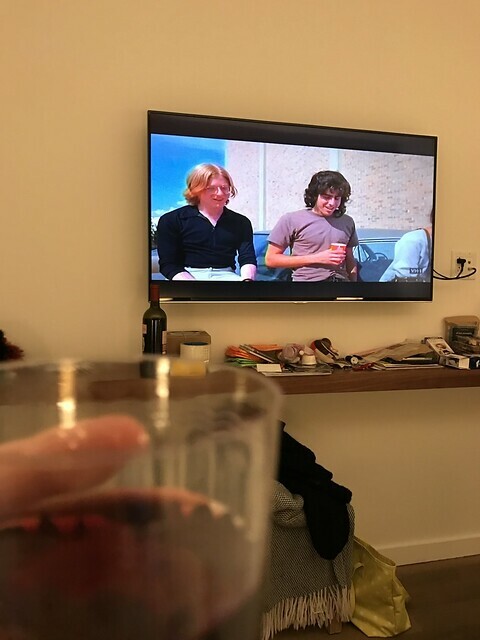 I ended my day with a free bottle of wine from Felix at the Cassa Times Square hotel and some cable TV (so fancy), and what do you know, Dazed and Confused was on! Our own Anthony Rapp is in that movie! (Ain't he cute?) Half-way through my 'wearing-cats-makeup-4-days-in-a-row' endeavor, I went to bed early.